Get a primer on a metal makeover you can use to restore rusted relics to better-than-new condition. Elegant and durable, metal makes an appearance on furnishings and decor in and out of the house, from entryway benches to patio chairs and fence posts. But the strong material has an Achilles heel: rust. Any metal made of iron or alloys containing iron, such as steel, will rust with enough exposure to oxygen and moisture. Paint offers one way to spare these rusted pieces from the junkyard and restore their looks while lending them a pop of color. But painting rust shouldn’t begin without first understanding the scope, benefits, and limitations of the project. Read about them below before going to the rescue of your rusted possessions with paint. Stick to painting metals with strictly surface rust. Painting rusted metal is not only possible but can produce beautiful results—as long as the rust doesn’t extend beyond the surface of the metal piece. If rust has partially or fully eaten through the metal (i.e. pits or holes are visible in the piece) or the piece has structurally weakened to the point that you can bend it by hand, then paint won’t halt the corrosion and inevitable crumbling of the metal. Filling the pits with an auto body filler product (like Bondo, which is readily available from Amazon) would be your best option for restoring it, or else you’ll need to replace the metal piece altogether. You’ll face blistering and peeling paint if you don’t remove loose rust first. A primer can help paint adhere to a rusted metal piece, but you still must first remove as much loose rust as possible from the surface first. Otherwise, the metal will continue to shed the loose rust, pushing the dried paint coat upward until it blisters or peels off. To avoid this, detach any hardware (screws, nails, etc.) from the metal surface, then run over it with a wire brush or sandpaper to scrape off as much rust as possible. Then, when no more rust flakes off, remove grit, grime, and grease. All it takes is a pass with a soft cloth dampened with a homemade degreasing solution—four teaspoons liquid dish soap mixed in one gallon of warm water—followed by a “rinse” using a water-dampened rag. Let the metal air-dry completely before breaking out the primer. You’ll need to apply a primer to boost paint adhesion and prevent discoloration. With the loose rust gone, your metal may either show extensive surface rust or little to no rust. Good news: You can cover up either! 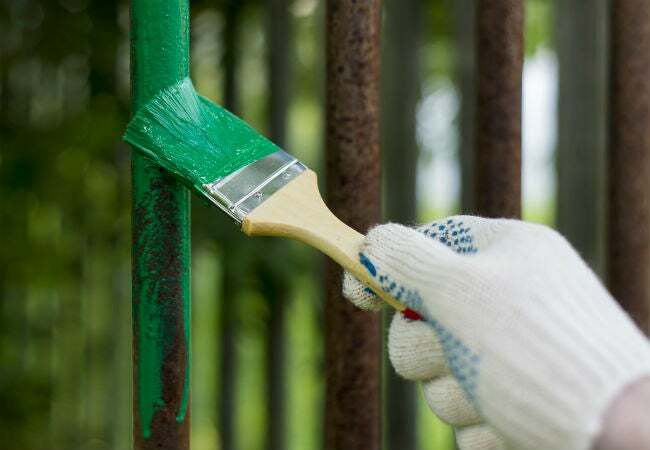 But paint alone doesn’t adhere as well to rust—even light rust—and when it does stick, rust stains can bleed through the paint coat and discolor it. A primer specific to your amount of rust will help aid adhesion. • If painting over extensive rust, prime it with a water- or oil-based interior-exterior rust conversion metal primer (available for around $4 to $17 per 10 to 13 ounces in spray or standard cans from brands like Rustoleum and Gempler’s). This coating will chemically convert the rust into a flat, usually black, non-rustable surface that’s ready to receive paint. • If painting over lightly rusted or bare metal (i.e. no rust remained after wire brushing it), then top it with a water- or oil-based interior-exterior rust-preventative metal primer (available for $4 to $8 per 12 to 15 ounces in spray or standard cans from brands like Rustoleum). The primer will penetrate the rust and bond with the underlying metal. You want to apply the primer as soon as possible after wire brushing and cleaning it since the metal will otherwise continue to rust with exposure to oxygen. Apply one to three coats of the appropriate primer to the metal surface, letting each coat dry to the touch before applying the next, then drying the final coat fully for the recommended amount of time. You can achieve a range of looks with commercial metal paints. The primed metal piece can be coated with either water- or oil-based metal paint (available for $4 to $9 per 12 ounces in spray or standard cans from brands like Rust-Oleum) in a wide spectrum of colors. Non-metallic colors like hunter green, in flat or matte sheens, can be used to give metal a back-to-nature look, while metallic colors like gray in a glossy sheen can be used to play up the lustrous, modern look of metal. Pro Tip: Aim to apply one or more coats of whichever paint color and sheen you choose, allowing each coat to dry according to the paint instructions before applying the next. 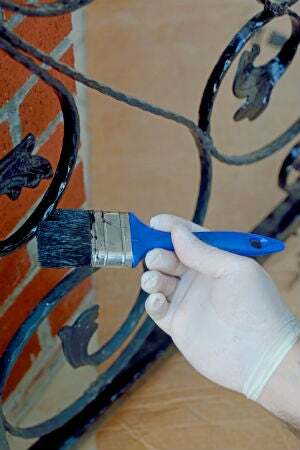 You can save lots of money painting rusted metal pieces rather than replacing them. Painting rusty metal items versus replacing them is a win for your wallet. 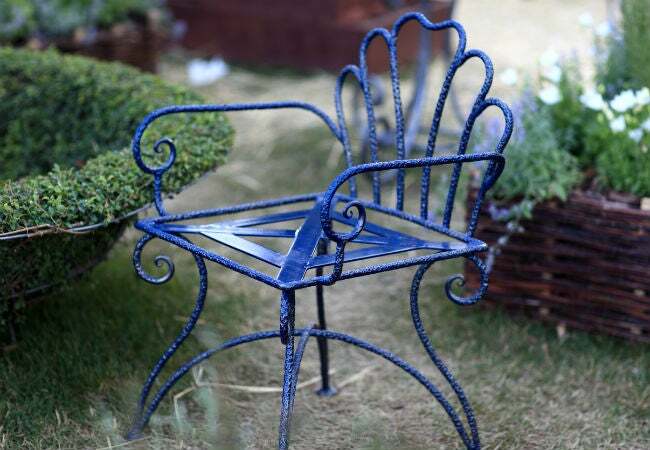 Add up the costs of a 12-ounce spray can of rust conversion primer and a 12-ounce can of metal paint that each cover around 15 square feet, and you’ll find that painting the rusty surface of a small metal piece such as an end table runs you as little as $8. Compared to the cost of scrapping the item and buying it new (which might start at $25 for a barebones metal end table), you’re looking at a savings of at least $17 for a minor project alone. The savings climb even more when painting larger or more decorative metal pieces. You should steer clear of oil-based finishes on galvanized metal. The protective coating around galvanized metal (usually made of zinc) can corrode with exposure to heavy rain or an accidental splash of a powerful household chemical like muriatic acid. With continued exposure to the atmosphere, the metal piece can form white rust. While you should still scrape off loose rust and clean the metal as recommended above for other metals, you should only apply a latex all-surface primer or universal bonding primer ($5 to $13 per 12 ounces from brands like Rust-Oleum) and a latex interior-exterior paint ($11 to $13 per 12 ounces from brands like Krylon) to galvanized metal. The reaction of zinc with the binders in oil-based primers and paints will only cause the paint to peel off.